Avisynth - What it is and why you need it. AviSynth and AvsP - What they are, and why you need to use them too! AviSynth is, in my humble opinion, the most significant addidition to Windows digital video editing in recent memory. It is incredibly powerful and, once you get used to it, it is incredibly convenient for doing all kinds of wonderful video manipulation tasks that would be very difficult to do otherwise. There aren't any problems with AviSynth in my mind but there is a problem with the way it is perceived. Many people don't really know what it is, what it does or why any of this is actually useful. Others feel that they don't need it because their method has worked for them and they are sticking to it... but I say if you give this program a chance you will soon wonder how you used to live without it. AviSynth isn't a program in the way you may usually think of programs. You don't run an .exe and use some graphical interface to change settings or anything - that's not the way AviSynth works. AviSynth is a video processing machine that works in the background. It's a trickster that makes video editing/playback software think that it is reading a video file when in reality the footage is being generated frame by frame to your design thanks to Avisynth. All you do is write a simple file with some commands on it and you give this file to a Video Editing program to read. When the Video Program looks at the file it doesn't see the silly commands you wrote: it sees video. The video the program sees is what you described in your simple file. Make a simple avisynth script that says "This is a bigger version of Video X"
Every time the program looks at a frame, avisynth takes Video X, makes the frame bigger and then gives it to the editing program. So, instead of having to make a brand new video which is bigger than the old one, AviSynth simply makes each frame bigger when the editing program wants to see that frame. This all happens behind the scenes so that the effect is that you have your bigger video but no need to re-encode or make a new file. And all of this can be done before the video program even sees the footage - and all in one place. You don't need one program to decode the dvd footage, then another to remove interlacing and then another to make it look better. AviSynth does all these things and a LOT more all in a simple script file that you write. AviSynth has become essential to Windows digital video editing because of this flexibility and also because of its immense power. The kind of deinterlacing and telecine removal that you can do in avisynth is something that you could potentially pay thousands to do as part of your professional video editing program. The ability to decode mpeg2 is something that many editing programs have these days but few can do it quite so accurately as AviSynth. Combine this with its ability to convert types of footage, and do all the other digital manipulations it does, then it's easy to understand why this is such as useful tool. And all of this is done in a mere few lines of text. That's the real beauty - you need to change something, you change the script. You want to add something else, you add it to the script. It's convenience in excess... you just need to work out how to use it. Avisynth uses scripts which you have to write and it is these scripts which tell avisynth what to do and what video to produce when this script is given to a video editing program. Now although these scripts are pretty simple things it is very different from what most people do - it's more like programming than video editing - but you'll pick it up pretty quick. Now an AVS script is simply just a plain text file that you could write in Notepad if you wanted to. However we have a much better tool at our disposal than notepad - AvsP. AvsP is like a souped-up text editor specifically designed for making AviSynth scripts. It has a ton of great features like syntax highlighting, autocomplete, integrated video preview, a tabbed interface for easily comparing different scripts, and so many other features that I really can't even get into them all here. Even if you don't understand what all of that means, just rest assured, it makes creating AviSynth scripts VERY easy and fast. But enough talk, let's jump right into it. 1) This is the currently selected tab, which shows you the AviSynth script you are currently working on. AvsP lets you open up multiple scripts at the same time in different tabs. If you want to duplicate a tab, simply double-click it. 2)If you double click in the empty area beside your tabs, it will create a new, empty tab. 3)This button opens up the video preview window beneath your script. You can also open or refresh the video preview by pressing F5 on your keyboard. 4)Press this skip backwards one frame in the video preview. 6)Pressing this button will open up your script in an external video player. The first time you press this button, AvsP will ask you for the location of the video player. While players like Windows Media Player or Media Player Classic should work fine for the most part, I would actually recommend setting this up to use VirtualDub, since it gives you a really quick way of bringing your script into VirtualDub for encoding. 7) Displays the current frame number. The first frame is numbered 0, not 1. 8) Trackbar that you can drag to seek through your video, just like in VirtualDub. 9) Status bar that tells you all sorts of useful information about your video, like the current frame number and current time in the video, resolution, framerate, colorspace, and even the coordinates and color of any pixel in the video that you move your mouse over. In the input file box, it should have the filename of the AVS script which you just saved. The output file box lets you specify the name of an AVI file which it will create. You should never need to change the settings in the "# of passes" or "priority" boxes. If you press "Run", then it will pop up a box asking you which codec you want to save the file with. I'm not going to get into the details of this now, but this feature is very handy if you want to quickly convert your AVS script to a lossless AVI file. We're done here, so you can just close the box and continue on. AvsP should turn the text dark blue like this, because it recognizes the phrase "ColorBars" as an internal AviSynth command. If you misspell it, it will stay black. Now, press F5 to bring up the video preview. You should now see a colorbars test pattern being displayed. Congratulations, you've made your first AviSynth script! Now if you press the button to open up the clip in an external player (assuming you set one up as described above), then when you play this file in your player, you will also hear an annoying beep along with it. This is the audio test pattern that is also generated by the ColorBars command. AvsP can't play audio, so you will always have to open your scripts in an external player in order to hear it. This menu contains a list of AviSynth commands that AvsP knows about. "ColorBars" should probably be the command that is highlighted in this menu, but if not, you can simply use your Up and Down arrow keys to find it. Once it's selected, you can press Tab to automatically insert the command into your script. One thing you need to remember is that the autocomplete menu will only come up if you capitalize the first letter of the command. This box is called a calltip and it shows you all of the parameters to the ColorBars command that you can adjust. Also, if you click directly on the calltip, it will open up the documentation for that command if it is available. Press F5 to check the result. Now for a bit of explanation about what we just did. The calltip told us that width and height were both integers (int), so that means we can just type in a number for those. If it had said they were "float" values, then that means we can use a floating point (decimal) value such as 320.587. If you try to use a value like that here though, it would just cause it to display an error. The final parameter was "pixel_type" which is just another way of saying Color Space. We could have used RGB32, YUY2, or YV12 here. Now you may have noticed that it lists pixel_type as being a "string". A string, in programming terms, just means a series of characters. Strings are always enclosed inside of quotation marks, while ints or floats should never be in quotes. This will do exactly the same thing as the previous line, but this time we have explicitly told it which values go with which parameter. The only reason previous line even worked was because we put the parameters in the correct order. What if just wanted to specify the pixel_type, but leave the height and width at their default values? So the important thing to remember here is that if you are specifying the parameters in the order that they appear in the calltip, then its ok to leave out the name of the parameter, but otherwise you need to specify their names. By using Enter instead of Tab, the autocomplete feature will automatically write all of the parameters, along with their default values, if AvsP knows them. 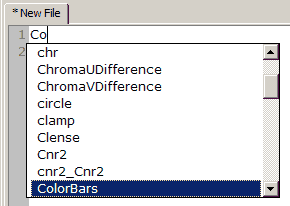 Unfortunately, AvsP didn't know the default values for the ColorBars command, so it just filled them with question marks, so this isn't the best example. We will look at this in further detail a little later though If you were curious though, the default values used by ColorBars are width=640,height=480, and pixel_type="RGB32". Now, why don't we try loading an actual video into AvsP? First, make sure to erase any commands that you have already written, so you are starting from an empty script. You can now select a video to open by either going to the File menu and then selecting "Open", or by pressing Ctrl+O, or by middle-clicking somewhere in your script. Just so we are all on the same page here, I would recommend that you grab one of my favorite AMVs, Believe by Kevin Caldwell, and try loading it. AvsP should generate a line that says DirectShowSource() and contains the path to the file. Pressing F5, you should be able to see the video. And on that note, this would be a great time to explain about some of the various source filters that you can use. AVISource() - This command will open an AVI file through using Video For Windows (VFW). This requires that you have installed whatever VFW video codec that your video uses. When loading uncompressed AVI files, or AVI files compressed with a lossless intra-frame codec, such as HuffYUV or Lagarith, then this is the command to use. DirectShowSource() - This command will open a video file using the DirectShow interface. This should be able to load any file that is viewable in Windows Media Player, but you need to be careful when you use this. The problem with DirectShowSource is that it is not frame-accurate. 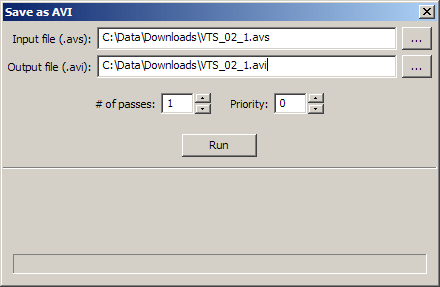 If you are just going to open the AVS script in VirtualDub and encode it, then thats fine. If you are planning to load this AVS directly into an editing program and start cutting it up, then that is a big problem. Just don't do it! FFVideoSource() - This source filter is a bit unique in that it is not one of the core filters built into AviSynth, but rather it is a seperate plugin that you must download and install. If you got the AMVapp, then this should all be taken care of for you. FFVideoSource is pretty cool because it lets you open most types of video files with frame accuracy. Now, FFVideoSource has a couple of caveats that you need to be aware of: first, it doesn't load audio (though you can use the FFAudioSource command if you really need the audio). Next, whenever you open a video with ffmpegsource, it will generate a small index file with the extension ".ffindex". The first time you open a file, you may notice a short pause while it generates this file. MPEG2Source() - This one is also only available through an additional plugin (but again, if you got AMVapp you are set). This is the command that should be used when you want to load DVD footage using a dgindex file. Since this guide focuses on using DVD footage, this is the command we will be using most often later on. WAVSource() - This can be used to load a WAV file for use as audio. There are other source commands, but these are the primary ones that you will be using. Now, you hopefully have your video loaded, so let's do some stuff to it! Each command in Avisynth needs to be on a seperate line, so keep that in mind. Now maybe I hate the song used in this video, and so I want to just get rid of that audio altogether. I can do this quite simply with the line KillAudio(). I see some black bars on the sides too, so why don't I crop those off? I can do that with Crop(16,0,-16,-0) [the crop command crops off the number of pixels you specify from the left, top, right, and bottom; the right and bottom need to use negative values]. Now, there might be a little bit of black space left around the video in some parts, but for the purposes of this example, I'm not going to be too picky. Next, this video is pretty darned small. I can barely see it on my huge monitor. I think I'll resize it up to 640x480 by using the line Spline36Resize(640,480). Now there are a lot of different filters that can be used to resize, such as BilinearResize(), BicubicResize(), LanczosResize(), and a ton of others. 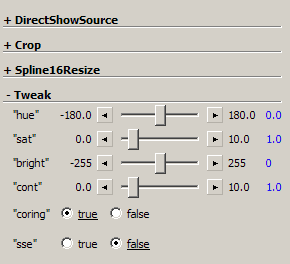 I think Spline36Resize gives a good result, so it's what I normally use. Now admittedly, this isn't a very useful script, but it hopefully helped you understand the basics of how AviSynth works. Now let's take a look at one of the really cool features in AvsP. Let's add yet another line to this script, and start typing Tweak. When you see it come up in the autocomplete menu, press Enter to have AvsP automatically fill in all of the default values. While that didn't work back when we tried it with ColorBars, it should work just nicely with this filter. Now if you have the video preview up, you may have noticed that as you add each command, you see it appear again over to the right side of your video preview, but with a "+" mark in front of it. If you try clicking on the "Tweak", command over here, it will expand to reveal something interesting. As you can see here, AvsP has automatically generated a user interface to adjust the properties of this filter! The tweak command lets you adjust things such as the hue, saturation, brightness, and contrast in your video. Traditionally, filters like this have been quite difficult to use, since you basically have to just guess at the values you want, and keep adjusting it until you get something that you like. With these sliders given to us by AvsP though, we can adjust these settings very easily! Careful though, as some of the settings are very sensitive. If you want to restore any particular setting to its default value, just click on the blue value on the right side. Avisynth plugins contain functions that people have written as additions to the core AviSynth tools. These plugins are essential to getting the most out of AviSynth as they give it abilities it would never usually have. If you have installed the AMVapp or any 2.5x version of Avisynth, you will have a folder called "Avisynth 2.5\plugins\" and this is the default plugin folder. When plugins are put into this folder they are automatically loaded into avisynth so you can use the functions straight away in scripts. Thankfully for you, you will not need to do this if you have the AMVapp installed. The AMVapp has a large variety of plugins and custom script functions, all of which do not need to be loaded manually. You will see exactly how to use these plugins in the guides that are to follow. You will notice that when you start using lots of functions that some of them work in some color formats and some do not. This is something you get used to pretty fast but you also need to be cautious when converting from one colorspace to another and try not to do it too often. YV12 - This is the colorspace used by DVDs, Mpeg1, Divx and basically most distribution formats. It is a way of storing YUV color that has one chroma sample for a 2x2 square of pixels and hence must have a resolution in multiples of 4. YUY2 - This is the colorspace used by some capture cards. It is another YUV format but this time there is one chroma sample for ever pair of pixels horizontally and hence must have a horizontal resolution which is a multiple of 2. RGB32 - This is the native colorspace that most editing programs will be using. However, try and think if this conversion is really necessary. When transferring DVD footage to an editing program you are going to have to convert to RGB32 at some point as that is the native editing format of most editing software. Likewise when you are converting an edited amv that you have made to Xvid you will need to convert it to YV12 at some point. Knowing this means you can use certain filters at certain times without having to do an unnecessary conversion. We will get back to this idea later - just remember that some commands only work in some color formats and some programs only edit in some color formats too. The final info you will need to know about Avisynth before we get onto other programs is that there are some functions which are not plugins but are loaded into avisynth when it starts. These are scripts that are contained in the plugins folder and have the extension ".avsi"
There are a number of these and they all contain interesting functions which will be described in greater detail as they are required. You can also define your own functions in these files - just follow the instructions in the AviSynth documenation on creating custom functions. These .avsi commands are automatically "included" when you make a new avs file so some of these avsi files are used for global settings. SetMemoryMax.avsi, for example, dictates how much memory each AviSynth script is allowed to use - this is to avoid crashes in editing programs when using many scripts. Now this isn't actually advanced stuff per se, it's actually quite basic. I think the following information can be quite helpful in making AviSynth scripts, but you can probably get by without it if you want to go ahead and skip to the next part of the guide. Crop(16,0,-16,-0) #this crops 16 pixels from the left and the right. Now theres a lot going on here, but I'll try to break it down as best I can. The first two lines load two different AVI files. I assign each to the variable names video1 and video2. On line 3, I loaded an audio file, which I assigned to the variable name audio. In line 4, I told AviSynth to take the clip stored as "video1" and resize it. On line 5, I join the two video clips together. finally line 6 joins the audio up with the video, and returns the whole thing as the final clip. This return value in the very last line is quite important. Without a return value, your script wont be able to function and will return an error, because it doesn't know what to output. If you were to write "return video2", then AviSynth would just return the original video2 file. All of the other lines where you joined it and added audio and everything wouldn't even matter, as if they weren't even there.